Remove dead and pesky trees with the help of Nature’s Touch. We’ll trim & shape your trees to help them grow to their potential. Call Nature’s Touch today to take care of your landscaping project. Keep your trees in their best condition without the hassle. 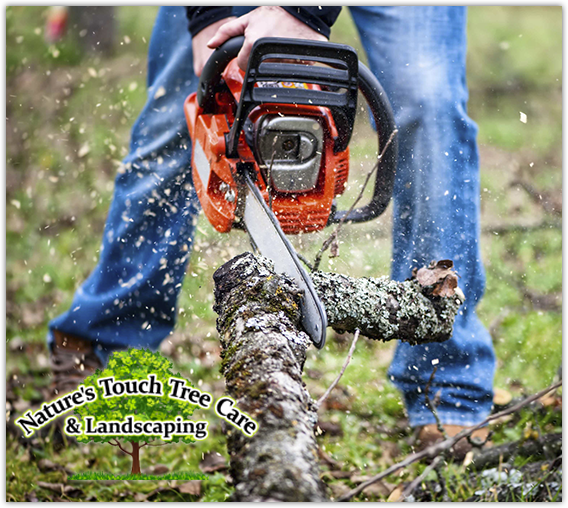 Nature’s Touch Tree Care and Landscaping was founded in 2006 with a group of young, hardworking professionals with a sincere love and true passion for the urban forest industry. The founder of Nature’s Touch, Justin Rahn, had nearly a decade of experience in every facet of the tree service industry before our business even began. We have built our business on complete customer satisfaction, and regularly go above and beyond to demonstrate our commitment to excellence and dedication to quality of service. Our certified arborists are involved in every project we take on, and our care for quality tree removal, landscaping maintenance, stump grinding, tree trimming, shrub removal and hedge trimming is apparent in every job we do. Our extensive knowledge and experience allows us to put more care and attention to detail in every service we perform. From tree trimming to complete tree removal and anything in between, you can count on Nature’s touch Tree Care and Landscaping to get the job done right. As longtime residents of Minnesota and dedicated tree care specialists, we are proud to serve in the communities we have lived in for years. Call us today for more information on our expert tree services in Eden Prairie, Chaska, Minnetonka, Chanhassen, Edina, Shakopee and Minneapolis. We’ll be glad to answer any questions you might have or come out to your site for a free estimate.